"Many of you will be aware that I fell and broke my fibula and did ankle ligament damage a few weeks ago when I was with 'The Orchestra' in Uruguay. Trust me to do something like that 6,000 miles and a 14-hour flight away from home ... but I have always been an awkward sod. Anyway, I just wanted to give anyone interested an update. I have been in plaster now for 5 weeks and have 3 weeks more before I am free of this thing and able to scratch my leg. A long slow recuperation will follow, but I am hoping to be back to my fighting best in 2012 ... as early in the year as possible, though there will be no stage somersaults for a while! Just wanted to apologize to anyone expecting to see me in eastern Europe with 'The Orchestra'. I had planned to be with the boys over there, but my doctor and consultant refused to give me permission to fly, and in truth, it would have been impossibly difficult for me with the schedule and travel arrangements the band has. I am gutted to have not been able to be with the guys, especially as this was to be my last tour as part of 'The Orchestra'. I will miss all the guys in the band a tremendous amount. I love them all like brothers and wish them every success in the future ... but circumstances have forced me to concentrate on my German projects from 2012 onwards. OK ... love and best wishes to everyone and have a great Christmas and New Year. Hope to see a few of you at Middleton Hall on December 10th." Having witnessed a number of gigs with the original ELO Part II line-up that included Neil Lockwood and Pete Haycock back in 1991 and 1992, Yours Truly KJS did not know what to expect when Phil Bates joined the band and took over lead guitar duties from the two previous incumbents for the bands 1993 UK tour. It was at Wolverhampton Civic Hall on Saturday 12th June 1993 that we first witnessed Phil's guitar wizardry and vocal work. And we were not to be disappointed. From 1993 to 2009 - during two separate spells with both ELO Part II and The Orchestra in countless gigs at places including Chester, Birmingham, Derby, Colchester, Telford and many more, we saw Phil grow and excel in the challenge of translating the ELO back catalogue to the live arena through his accurate guitar and vocal contribution. It was the toughest of assignments to replicate the sonic genius of Jeff Lynne - but Phil pulled it off. In addition to that, we were also blessed to taste the song writing prowess of Phil with his contributions to the 1994 studio album "Moment Of Truth" and the 1995 live album "One Night - Live In Australia". Doubtless we can all look forward to partaking in Phil's musical journey going forward starting with The Phil Bates and Tina McBain Christmas Show on Saturday 10th December 2011. 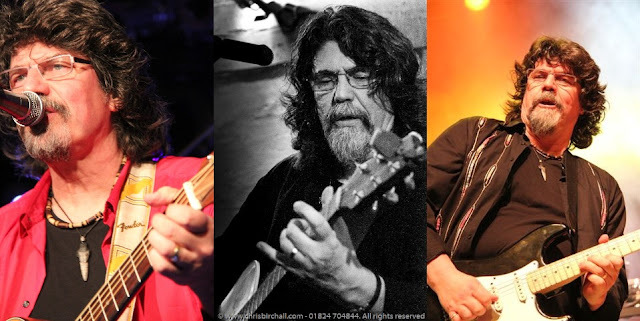 Phil will be busy in 2012 with his other projects including the Beatles Blues and Blue Violin Project [BBBV] and his German outfits ELO Klassik - The Music of ELO performed by Phil Bates and the Berlin String Ensemble and The Music of ELO - performed by Phil Bates and band. Maybe we could also see the return of the fantastic Wheels Of Fire again too - if interest and time permit. Whilst I am tremendously sad to see Phil Bates' second spell with ELO Part II and The Orchestra come to an end, I wish to take the opportunity to wish Phil [and his wife Joanna] all the very best in their ongoing musical projects thereafter. Without a doubt Phil was a major player in both bands for the best part of two decades and it is for that role I am truly thankful to Phil. For his significant contribution in keeping the ELO sound live when others would not.